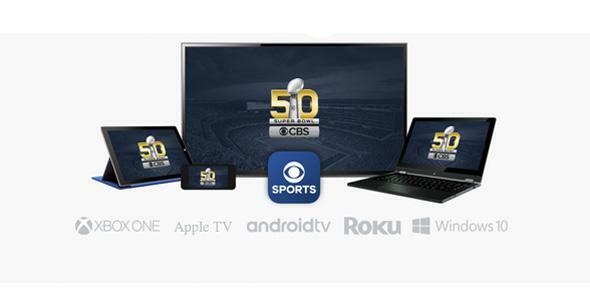 How to stream the Super Bowl even if you don't have a cable login. Set top boxes and screens for using the CBS Sports portal/app. It’s pretty easy to be a cord-cutter these days, relying on streaming services and set-top boxes instead of paying for cable. But for certain big shows and events, you likely still find yourself scrambling to borrow someone’s cable credentials. Luckily, you won’t have to prostrate yourself before your ex-boyfriend’s dog walker’s cousin to gain access to a Super Bowl stream on Sunday. There are a bunch of ways to view it for free. The first place to check is CBS, the network broadcasting the game this year. There will be an open stream on the CBS Sports website and through the app, which you can download for platforms like Android, iOS, AndroidTV, Roku, Xbox One, Apple TV, and Amazon Fire products. Only Verizon Wireless customers will be able to stream the game on their smartphones because of an exclusivity deal with the NFL. GeekWire notes that international viewers can watch through NFL Game Pass, but a subscription to the service costs $100 per year. Not exactly free. And the New York Times lists popular digital antennas, if you want to watch over the air the old-fashioned way. I have a cheap indoor HDTV antenna from Amazon Basics that works fine, but depending on how far you are from signal transmitters, you may need a better-quality model. Television networks have been streaming the Super Bowl live and for free since 2012, which is a good reminder of how far cord-cutting culture has come in a few short years. It’s already the fifth anniversary of free access the game. And the networks seem to be evolving with the trend, however slowly. This year for the first time, the CBS livestream will show all the ads that run on the regular broadcast. No point missing out on online viewers when there are more and more of them every year.